I remember Bleak House as a young boy attending Woodlands Junior school in the seventies. I would often walk past it with school friends and of course lurid scary stories would circulate about its history and who lived there. Other than its generally imposing and gloomy facade I distinctly remember a couple of stone or possibly concrete eagles looking down from the gate, guarding the place. Can't put a year on its demolition, I don't live far from it today and remember flats being built on it during the nineties. Would love to see any photos and know a bit more about its history. I wonder how long it remained empty before its destruction? lordraglan. A very fine aerial shot , Bleak House would be on R.H. edge about 1/3 down just past the row of houses. Nice to see the cement works chimney smoking. As you can see, the chalk pit was enormous, about 40ft. deep. Some infil! We used to slide down to go to the ponds to catch newts, then a hard scrabble to get back up again- this was late 30's. During WW2, the Home Guard had their firing range down there- ideal. the2nd. Interesting about Beatty Avenue, I lived in Cornwallis Ave. The only air raid casualties we suffered in that part of Gillingham was a direct hit on a house in Beatty, all the family were killed in their Anderson air raid shelter- we were told by concussion.Although 1/4 mile away, I can still hear the whoosh of the bomb(s)- and we were in our Anderson! As a cab driver using Gillingham station a lot during the late 60s I took an older gent to Bleak House on a number of occasions. Only a short run costing about 3/6d from memory but he was a nice enough person. It really did look quite bleak as it wasn't exactly a brightly finished place. Grey rendered walls outside from memory. 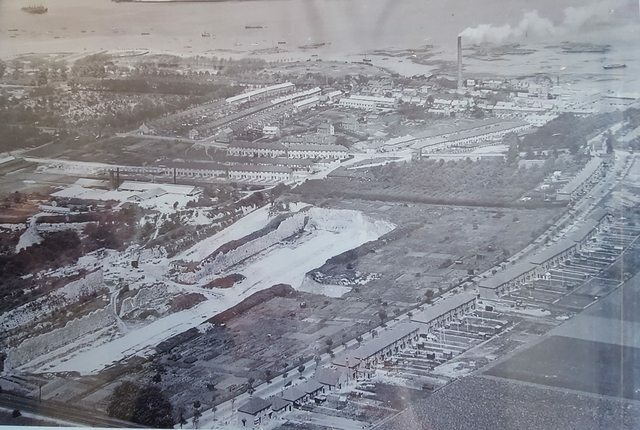 I have the perfect photo of the area, at around 1938.
early in my childhood, as some children had drowned in it so my mother told me. and head office of his company, which dug up a lot of the area as brickfields, hence the steep hills round there. As for the chalk pit, I remember it when it was a landfill site by the path running alongside the railway, before it became a field. Bleak house stood at the corner of Woodlands Road and Grange Road. It was a typical Victorian house, double bayed as I recall, quite gloomy in grey render, with a wall round it. Behind the facade may have been somethnig older? It was there in the very late 70s, but now demolished with something else on the site. The stone gatepiers said "Bleak House" by the way. I took a photo of it, but haven't seen it in yonks, I may still have it. Or indeed the negative.... I'll have to have a root around. I was born in Woodlands Road, the Chalk Pit was filled in early in my childhood, as some children had drowned in it so my mother told me. My partner grew up in Beatty Ave. but not till the 80's. Where was the old house sited?